A view of the Ecohouse from Dairy Lane. Photo courtesy of The Post. 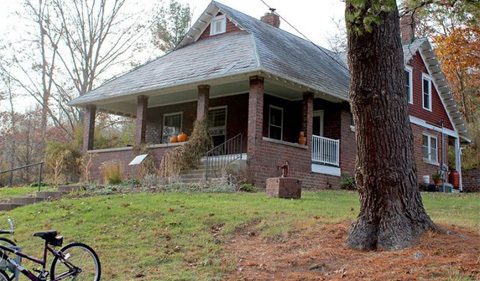 Made from century-old bricks and shingles, the Ohio University Ecohouse may look like any old farmhouse in Athens. However, up the concrete steps to the spacious front porch and through the squeaky storm door is a warm and welcoming living room and dining area where the annual Sustainable Thanksgiving Dinner will take place on Nov. 15 starting at 6 p.m. Spots are limited for this event; sign up online. 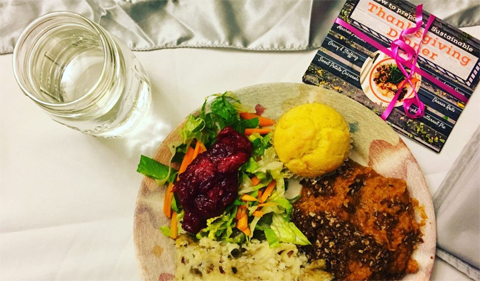 Meg Little, an Environmental Studies graduate student who is currently living in the Ecohouse, loves hosting events for the public, especially the Thanksgiving dinner. The dinner will consist of all vegetarian and vegan dishes made from locally grown produce. Homemade party gifts made from foraged berries and vines will be given to guests. Little hopes to attract at least 40 people for the dinner so they can establish the house as a welcoming community space where Athens residents and Ohio students can connect and learn about sustainable living. Sustainability Specialist for the Ecohouse, Elaine Goetz, said the purpose of the public workshops and events is to show people how attainable living more environmentally sustainable can be. A dish from the Sustainable Thanksgiving dinner last year. Katelynne McKnight, a past resident if the EcoHouse, said coming to the Thanksgiving dinner was what made her decide she wanted to live in the Ecohouse. Another event at the Ohio University EcoHouse open to the public will focus on sustainable body care. On Nov. 30 at 4:30 p.m. participants of this workshop will learn how to make their own eco-friendly body care products. The products will be shaving cream, body lotion, and deodorant. The shaving cream will consist of coconut oil, shea butter, Jojoba oil, and liquid castile soap. The body lotion will consist of beeswax, shea butter, and any oil besides coconut. The deodorant will consist of beeswax, cornstarch, baking soda, arrowroot powder, powdered sugar, shea butter, coconut oil, vitamin e oil, vanilla essential oil, spearmint oil, and tea tree oil. For more information about the workshops, contact Little at ml115617@ohio.edu. Little hopes to continue these workshops throughout the rest of the year.